[Check the Previous Story!] 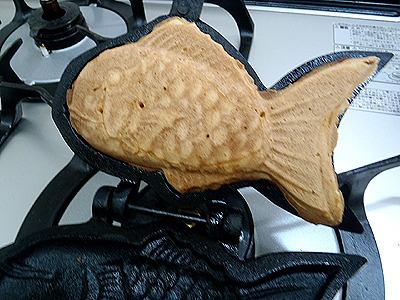 Our blogger Mr. B purchased a ‘taiyaki’ iron, and his first mission (baking a regular taiyaki beautifully) was completed successfully. 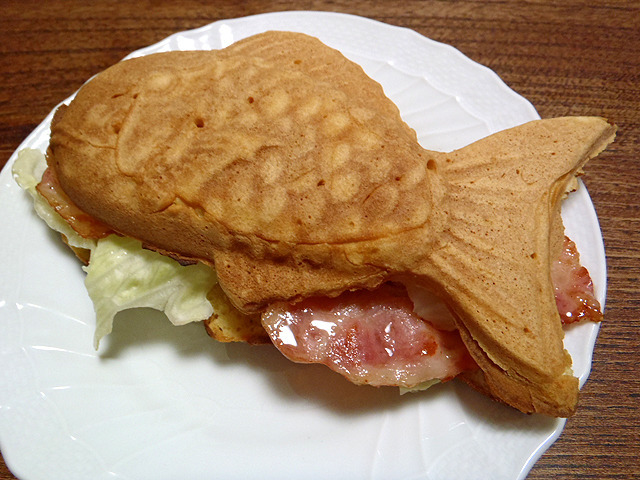 The first unique taiyaki is made only with ‘anko’ (sweet read bean paste). All you need is anko. 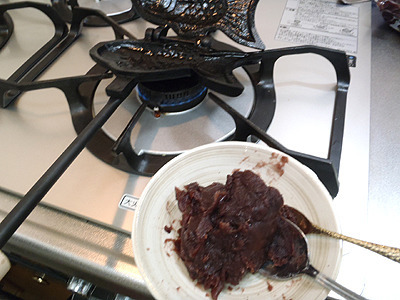 The entire process consists of stuffing the iron with anko and baking. 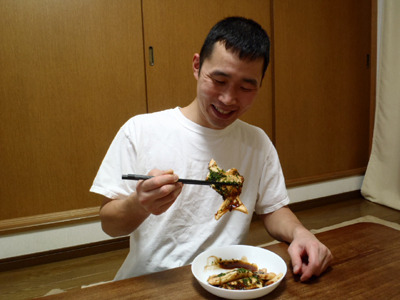 but he seems pretty happy with it. 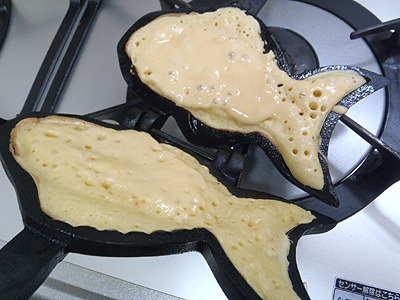 The second unique taiyaki begins like this. But wait! Mr. B is slicing it in half, longways. 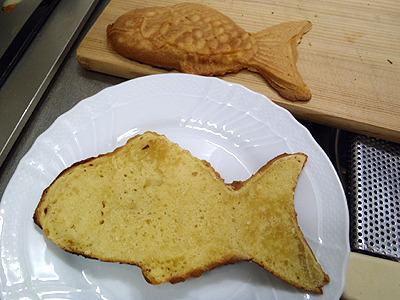 Maybe these two pieces of taiyaki dough remind you of something. Think of it. Nothing coming to mind? Then look at the next photo! A sandwch! 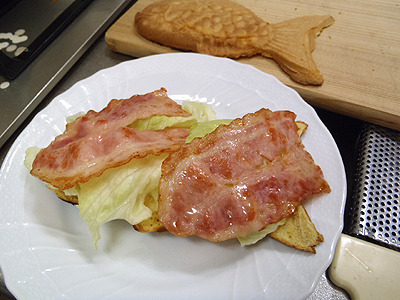 ‘B’ for bacon and ‘L’ for lettuce, and ‘T’ for….? 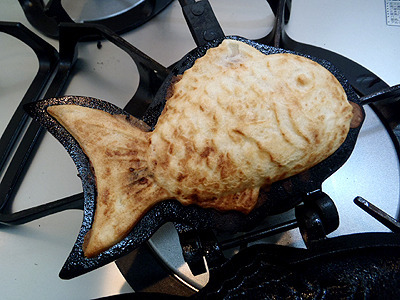 Taiyaki! A BLT sandwich! 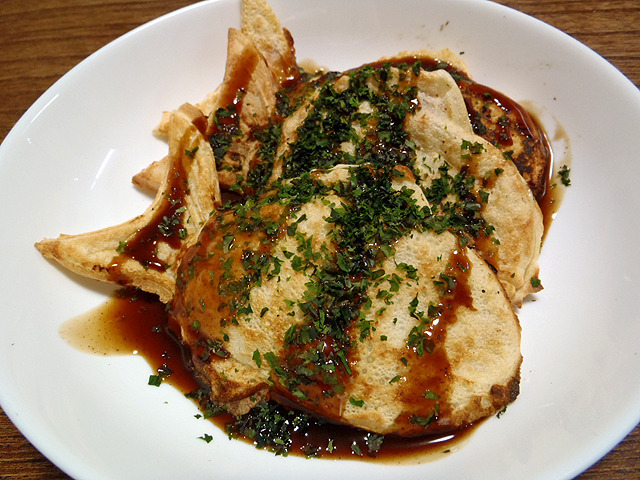 Looks good, doesn’t it? But Mr. B looks gloomy. 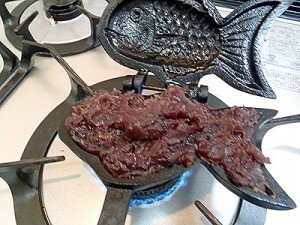 According to him, the sweet batter and salty bacon don’t go together well, LOL. 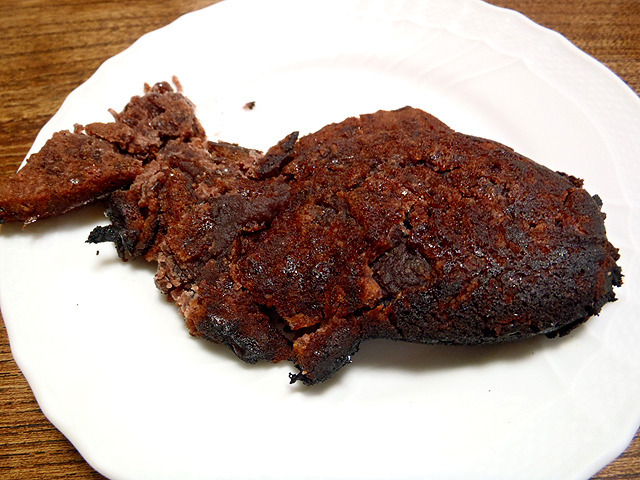 I think he should have made the batter unsweetened. 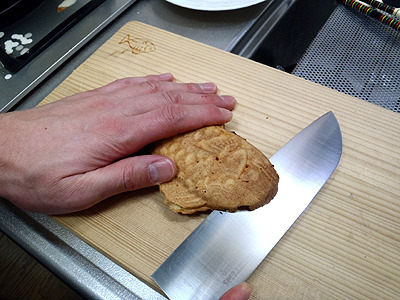 The last unique taiyaki is a ‘takoyaki’ (octopus ball) version. 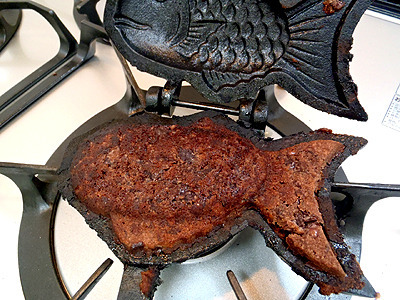 fish-shaped ‘takoyaki’ with a taiyaki iron. 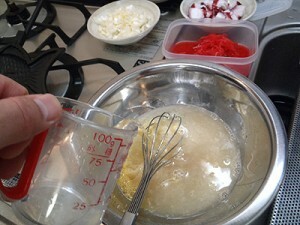 For the batter, mix up soup stock, egg, and a bit of salt. 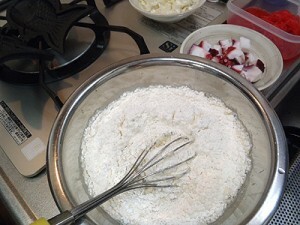 And apply some flour. 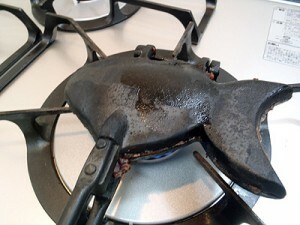 Pour the batter into the iron. 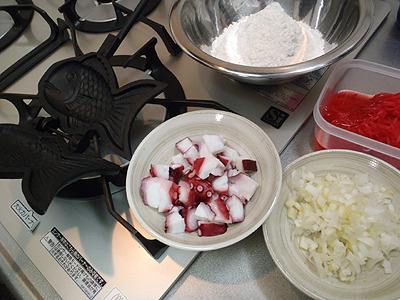 red ginger and chopped long onion. 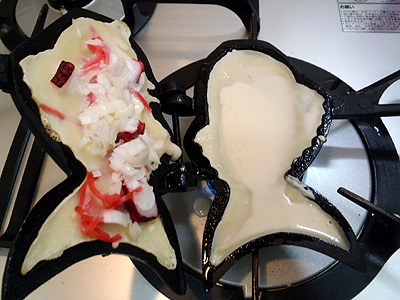 and put the both sides together. 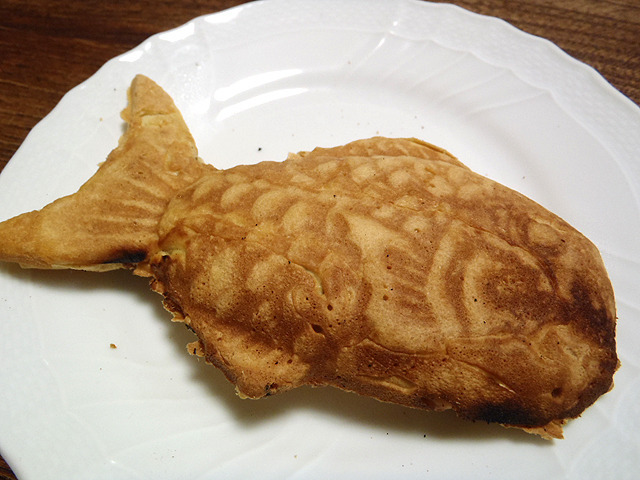 So far it still looks like a normal taiyaki. Mr. B seems really happy! 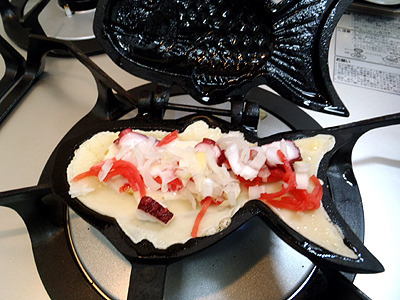 If you have a chance to get a taiyaki iron, do it. 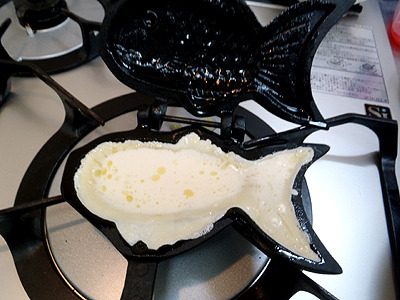 Then you can make plenty of creative fish shaped treats!